already signed and posted just awhile ago. thnx! Signed, thanks you for sharing. Signed. 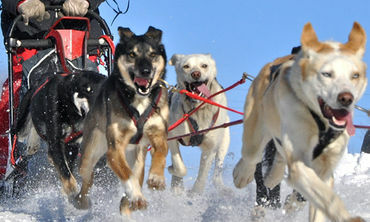 I was living in Vancouver BC when a dog sledding outfit had an employee 'cull' close to 70 dogs in a brutal mass murder. These beautiful dogs were purchased in over abundance to take out visitors to the Olympic (a nauseating waste of money) when they were done with them, they disposed of them in a horrific manner. I actually threw up when I saw the news reports, and then cried watching the monsters get away with it. This is a horrible business. Noted and already signed - how do these retarded idiots know that the dog is having fun - are they the dog! Put them on harnesses and bloody well whip them to run kms and kms and then see how they like it. Signed. I hope it helps. Call of the Wild is a book that still aches in my heart. Nancy, I'll catch the others later. I just went through and signed the ones that seemed most urgent and a whole lot of others on the way. I've been up all night and I'm tired,. But, yes, I had fun getting that way.